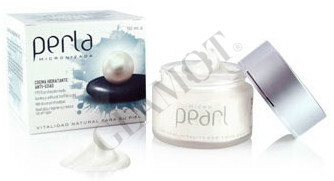 Facial cream with micro pearl powder. The daily use of micro pearl powder is a UNISEX product ideal for all skin types as a moisturizing cream base anti-age during the day. Especially recommended for mature skins. The sun protection factor 15 medium protection, complies with EU/Colipa, US FDA, Australian Standard normative and the Colipa recommendations(UVA protection),and together with Tocopherol (a potent natural antioxidant ),vitamins pertaining to B,E,A and F groups, protect the skin from premature ageing due to UVA and UVB radiation. Oils obtained from Rosehip, Shea Butter, guarantee that the product does not contain any mineral oils in its composition and for this reason does not make the skin at all greasy, thanks to its high penetration capacity. The moisturizing factors will protect your skin all day long; the resulting silky skin effect is lasting and is noticeable from the first application, and its delicate perfume will remind you that the micro pearl continues to act on your skin. Apply in the morning on the face and neck making sure your skin is clean and dry. Spread with soft circular massages to promote better penetration of the cream.